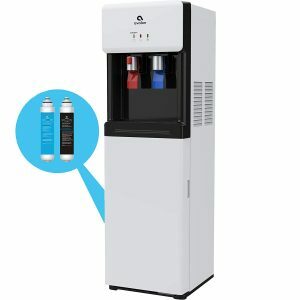 White Avalon A7BOTTLELESS is a modern, free-standing and self-cleaning type bottle-less type, 6 cubic feet capacity water cooler and dispenser with an innovative slim design for instant hot and cold water. It is rated 4.2 out of 5 stars by 33 customers on the day of this review and we’ll go through them as well, to see if it is worthy of the price tag. You can get it in wither white or black depending on what you fancy or think would suit your office or home decor better. You can see the red hot and blue cold water spouts in the photos for very cold and piping hot water and there is no separate room temperature spout. What you do is turn off the heating switch at the back to be able to get water at the room temperature. There is an integrated filter indicator with light that tells you when you need to change the filter. And the spouts will be seen clearly thanks to the integrated night light that aren’t too bright. Avalon A7BOTTLELESS is a UL and Energy Star approved unit with a child security lock on the hot water spout. And you can have a peace of mind that your kids will not burn themselves by accident. 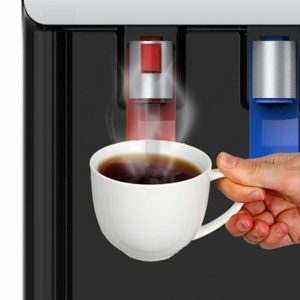 The water dispensing unit is purified and sanitized with the built-in self-cleaning ozone function. And there won’t be any build-up of bad bacteria and germs and you’ll enjoy purer, cleaner and tastier water at all times. Any lead, chlorine, rust, bacteria or germs will all be eliminated by these filters. Avalon Water Cooler is made of solid plastic and has a modern design, weighs 42 pounds and measures 13 x 12 x 41 inches, if you are restricted on space and want to measure the space you have for a water cooler. The dispensing area measures 10 x 2.5 x 9.5 inches and there is a 7.5 inches of space just below the spouts for you to put taller cups. With this brand new model you won’t have to buy bottles of water, hence reducing the cost. And you will not be lifting heavy bottles or spilling water everywhere. Two NSF certified filters are included in the package: a 1500 gallon carbon block filter and a 1500 gallon sediment filter- both for roughly 6 monthly use. You need to change the filters every six months. In the box you’ll get the water dispenser, water filter and an installation kit. The water line is a part of this installation kit and you can hook up the line to any sink water supply. It is very easy to use with the convenient paddle spouts. What happens is water comes out of the water source and is filtered though the filter and then go into the water tanks (3.6 liters of cold and 1 liter of hot water capacity) to be delivered via the spouts. The water it delivers is roughly 47 degrees Fahrenheit and you won’t need to put any ice cubes in. And the hot water is at 185 degrees Fahrenheit, which is hot enough for making hot beverages like tea, coffee or hot chocolate or to cook your instant porridge or noodles. Any water spilling or drips will be caught by the detachable tray below the dispensing area. You need to empty the tray manually as there is no separate drain. It comes with the clear instructions and is pretty easy and straightforward to install. All in all it is very much worth the price tag. It runs very quietly and you won’t even be able to tell if it is on.